No, this post has nothing to do with umpires. I heard about the Stockton Stingrays last year, a group that plays beep baseball, at a Stockton Ports game where they were special guests and one of their players threw out the ceremonial first pitch. 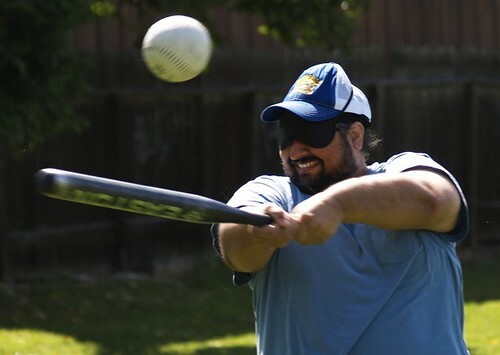 The Stingrays, organized by the Community Center for the Blind and Visually Impaired, are a team of blind and visually impaired people who enjoy playing the game. Here’s how this works: There are two bases, where first and third usually are. 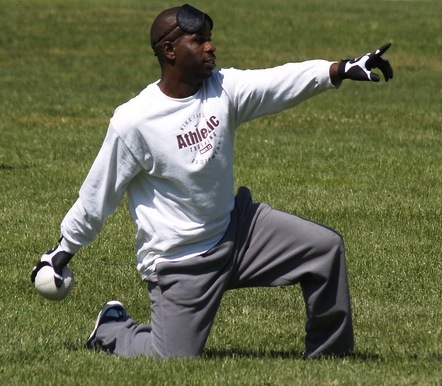 All players, regardless of visual ability, are blindfolded. The bases are large, plush, blue pillars that buzz, so a player can track them by sound. A coach controls which base buzzes with a little switch (held here by team captain Jennifer Boylan). When a player hits the ball, he or she can score a run for their team if they make it to the buzzing base before a fielder scoops up the ball. The beep ball is basically the size of a softball, but it beeps when a plug is pulled. Fielders have some help, though. In the field are two spotters who are able to see, and they call out areas of the field, 1 through 6 — 6 being the middle of the field, with areas counting down to 1, by each base. Players get near the beeping ball, crawl around and pick the ball up. The batter is ruled out if the fielder has control of the ball before the batter reaches base. The fielder has to hold the ball away from his or her body to make the out. The Stingrays have been pretty successful, most recently earning a berth to the 2009 National Beep Ball Association World Series. 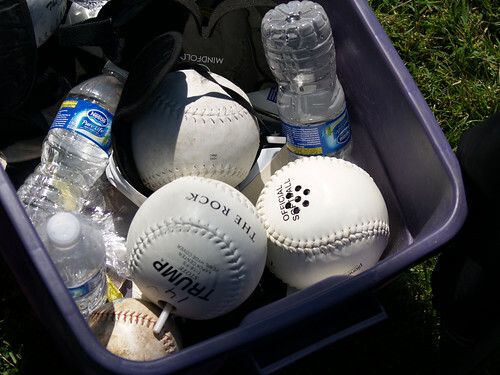 I’ve been pretty intrigued by the sport, as I know baseball/softball is pretty hard to do when you can see. I couldn’t imagine being blindfolded. The team also accepts members who do have vision, but they also have to wear blindfolds. One of the assistants, Richard, said he tried one time, but didn’t really have any success, although it was fun. I was really impressed, some of the people out there could field and hit pretty well. 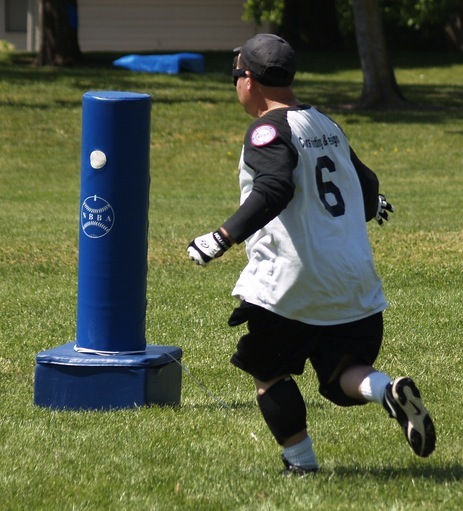 The Stingrays practice and play every Saturday morning at Atherton Park in Stockton. They have a game this Saturday, and they also take on challenging teams who go blindfolded. They’re a great group of people and I hope I can get out there for a game sometime. Check out the Stingrays’ website here. Click here for a few more pictures from that afternoon. Previous Post Journalist or not? It was so awesome to have you out at the park with us Justin! Thanks for the great article and pics, it means a lot to us to have interest and community participation in our sport! 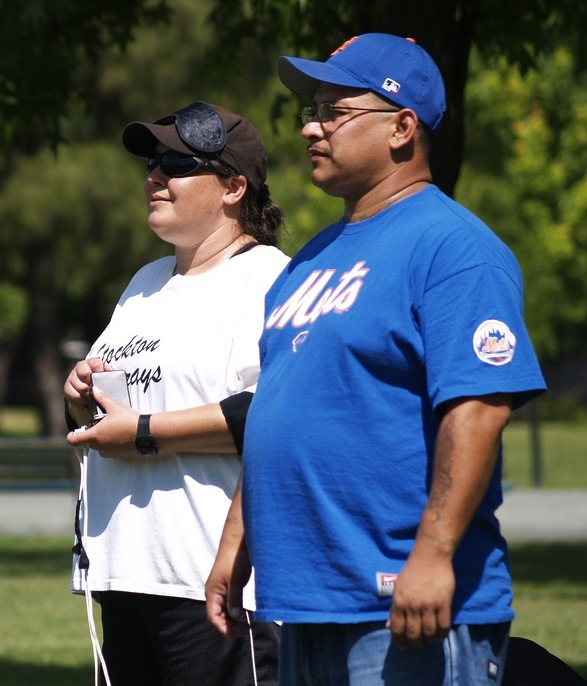 We’re seeking groups of 6+ to schedule a game but anyone who shows up at the park is welcome to take a swing–anytime! Catch our game vs Tracy Surgery Center 6/5! Our season is in full swing and the Stockton Stingrays are getting down to the wire and hoping to have the funds to send our team to Rochester, MN this August for the NBBA World Series. All tax-deductible contributions would be so appreciated, contact Community Center for the Blind (209) 466-3836. 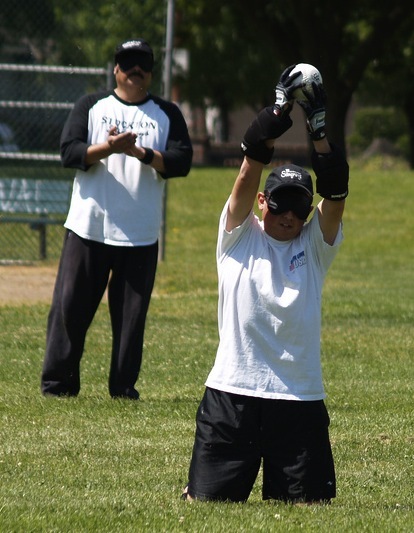 Now seeking players, volunteers and supporters–thank you for pitching in and stepping up to the plate for blind athletes from the greater San Joaquin County area!